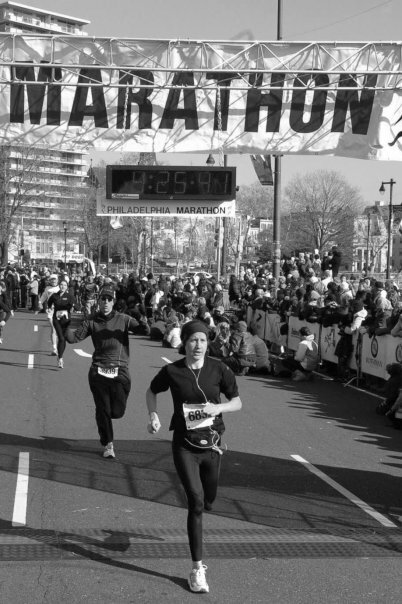 The Philadelphia Marathon represents many things to many people. A common bond is a love of the Philadelphia Marathon. In their own words, race competitors explain why they love the Philadelphia Marathon and return to the race course. Marathon Background: Malinda ran her first marathon (Marine Corps) in 1995. She ran San Francisco in 1998 and then her first Philadelphia Marathon in 2008 with her identical twin Leah. She also completed the Charlottesville Marathon in 2009 and the Walt Disney World Marathon in 2009 and 2010 while dressed as Minnie Mouse after running the half marathon on Saturday — otherwise known as Goofy’s Race and a Half Challenge. 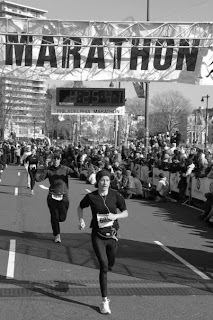 Malinda ran her second Philadelphia Marathon in 2011. Although the weather was ideal, she did not train properly to set a PR. However, she reached her goal of finishing under 4:41 — posting a 4:40:59! Malinda loves to run in costume so you may see her dressed as the Queen of Hearts, Minnie Mouse or Belle at the Philadelphia Marathon! Why I Love the Philadelphia Marathon: “I love running the Philadelphia Marathon because of the mostly flat, historic, scenic course and the enthusiastic crowd support. An added bonus is it’s a local race since I live in Wynnewood. Earlier this year, Leah and I deemed ourselves ‘TWINS RUN in our family.’ We blog about our opposite approaches to running and our experiences running together to support Alex’s Lemonade Stand Foundation for Childhood Cancer at www.twinsruninourfamily.com. This year, I look forward to raising awareness for Alex’s Lemonade Stand and running my personal best at my hometown marathon!" Phila. marathon is definitely a great one. I've run it three times and enjoyed it every time. Perfect weather, fast course, and great scenery! I would love to run Philly. Wish I had done it before I left the East Coast! Bucket List for sure!